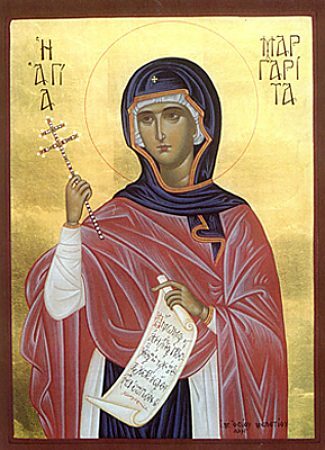 The Holy GreatMartyress Marina was born in Asia Minor, in the city of Antioch, into the family of a pagan priest. In infancy she lost her mother, and her father gave her over into the care of a nursemaid, who raised Marina in the Orthodox faith. Upon learning that his daughter had become a Christian, the father angrily disowned her. During the time of the persecution against Christians under the emperor Diocletian (284-305), Saint Marina at fifteen years of age was arrested and locked up in prison. With firm trust in the will of God and His help, the young prisoner prepared for her impending fate. The governor Olymbrios, charmed with the beautiful girl, tried to persuade her to renounce the Christian faith and become his wife. But the saint, unswayed, refused his false offers. The vexed governor gave the holy martyress over to torture. Having beaten her fiercely, they fastened the saint with nails to a board and tore at her body with tridents. The governor himself, unable to bear the horror of these tortures, hid his face in his hands. But the holy martyress remained unyielding. Thrown for the night into prison, she was granted Heavenly aid and healed of her wounds. Tied to a tree, they scorched the martyress with fire. Barely alive, the martyress prayed: "Lord, Thou hast granted me to go through fire for Thine Name, grant me also to go through the water of holy Baptism". Hearing the word "water", the governor gave orders to drown the saint in a large barrel. The martyress besought the Lord, that this manner of execution should become for her holy Baptism. When they plunged her into the water, there suddenly shone a light, and a snow-white dove came down from Heaven, bearing in its beak a golden crown. The fetters put upon Saint Marina of themselves came apart. The martyress stood up in the fount of Baptism glorifying the Holy Trinity – Father, Son, and Holy Spirit. Saint Marina emerged from the fount completely healed, without any trace of burns. Amazed at this miracle, the people glorified the True God, and many came to believe. This brought the governor into a rage, and he gave orders to kill anyone, who might confess the Name of Christ. There then perished 15,000 Christians, and the holy Martyress Marina was beheaded. The sufferings of the GreatMartyress Marina were described by an eye-witness of the event, named Theotimos. Up until the taking of Constantinople by Western crusaders in the year 1204, the relics of the GreatMartyress Marina were situated in the Panteponteia monastery. According to other sources, they were located in Antioch until the year 908 and from there transferred to Italy. Her venerable hand was transferred to Athos, to the Batopedeia monastery.